Today is the second part of a 2-part interview with Dr. Kate Bowler about Blessed: A History of the American Prosperity Gospel, published earlier this year with Oxford University Press. PLS: Pardon the pun, but some of the richest interpretive elements of Blessed are the 8 network diagrams (pp. 47, 81, 84, 85, 92, 121, 258, 259) you constructed to provide a stunning visual explanation of the deep connection and numerous affiliations between prosperity teachers and preachers. Can you discuss this part of the book? KB: This was the beginning of my love affair with spreadsheets. In light of the difficulty of identifying who is a prosperity preacher in such a fluid movement, I began to look for ways to track and measure participation more meaningfully. 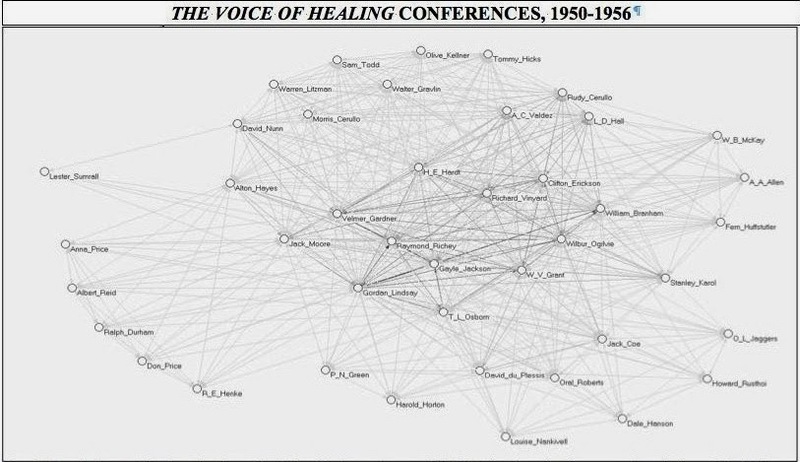 My largest network was a compilation of every advertised conference in Charisma magazine from 1980 to 2010 which tracked 4,267 separate speakers across 1,637 conferences. 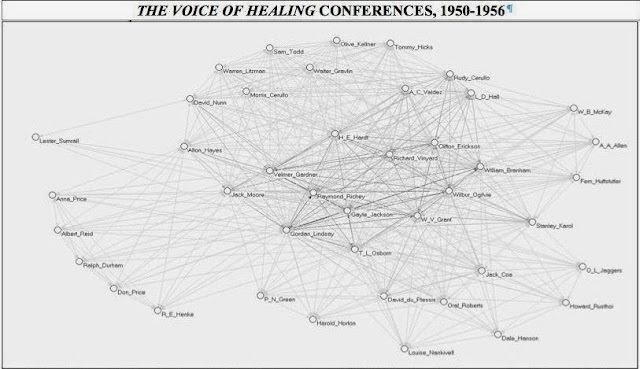 This much tidier diagram of a single conference, The Voice of Healing annual conference, 1950-1956) makes the point. The network visually represents an early hub of pentecostal revival preachers, many of whom adopted some formula for how to receive financial blessings. The lines between preachers indicate that they shared a conference platform, and the greater total number of intersections draws them closer to one another and to the center of the diagram. This image draws attention to the importance of early prosperity preachers like T. L. Osborn, W. V. Grant, and Gordon Lindsay. The comparative marginality of big names like Oral Roberts and A. A. Allen, on the other hand, confirms that their massive ministries had outgrown the need for this support. After having scoured the archives for these preachers, an image like this helped me weigh and measure the significance of each minister’s contributions to the movement. Throughout, I relied on these spreadsheet to follow the rise of new networks, gauge the density of their interactions, and help date the where’s and when’s of how ideas spread. PLS: Similarly, another bountiful portion of Blessed are the Appendixes, particularly Appendix B where you detail terminological difficulties with the term “prosperity” and otherwise wax academically (and poetically) on important considerations for studying the prosperity gospel. Can you summarize this for us? Since your work is the first history of the prosperity gospel in the U.S., in your estimation, what does the future of the scholarly study of the prosperity gospel look like? KB: Part of the headache of writing Blessed was that no one wants to be called a prosperity preacher, and the movement includes a wildly diverse assembly. The book could have been easily consumed by trying to defend who I included and why. So, I tried to map out of a rubric for identifying the kinds of connections that tie these people together into this movement: rhetorical (what special vocabulary do they use? ), associative (what denominational and conference markers set them apart? ), educational (what earned and honorary degrees do they share? 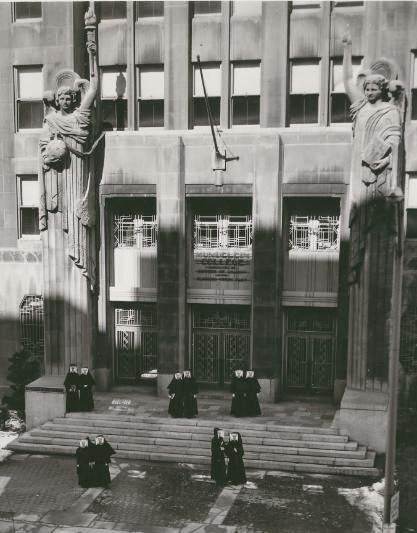 ), and performative (where and how often to do they share ecclesial spaces?). But much of this history is still obscured and will benefit from new interdisciplinary work on its media impact (Katie Hladsky, JonathanWalton), immigrant networks (Arlene Sanchez Walsh), cultural biography (PhilSinitiere), contemporary pentecostalism (Joseph Williams) and so many others. The subject is wide open, and (I hope) increasingly transnational in scope. PLS: During the course of your research, what surprised you most about the American prosperity gospel? What was most disconcerting? KB: Like most people, I used to think that the prosperity gospel was about money. What I learned was that, though we might not always like its prophets, millions of believers choose this message every Sunday because it uses a Christian framework to remind them that God cares about the details of their lives. But that comfort is limited. When they read God into their biographies as proof that their faith is working (or not), this theology stokes their fears that every misfortune is of their own making. Often, the prosperity gospel heaps spiritual condemnation on tragedy. PLS: Finally, what are you working on now? KB: While working on Blessed, I realized how much the prosperity gospel makes Christians profoundly nervous. Not for its errors, but for its similarities. So I’ve begun a new project which will be a broad history of economic anxieties in American Christianity, particularly through the lens of immigrant churches and narrations of the American Dream. How have American believers explained and theologically justified the rise and fall of their good fortune? Their deep ambivalence about financial successes is where this project begins. I have a technical question. I'm curious what networking draw program you used. I used Excel, UCINET, and NetDraw 2.0 to put together a few of the businessmen's networks for my project, but they never looked that pretty. But Deg, your handdrawn diagrams that you posted on FB had that certain je ne sais quoi! It was through PAJEK. Cyrus Schleifer, a graduate student in Sociology here at Duke, made the networking photo magic happen.